This article has some interesting points about sexism and sexual equality. 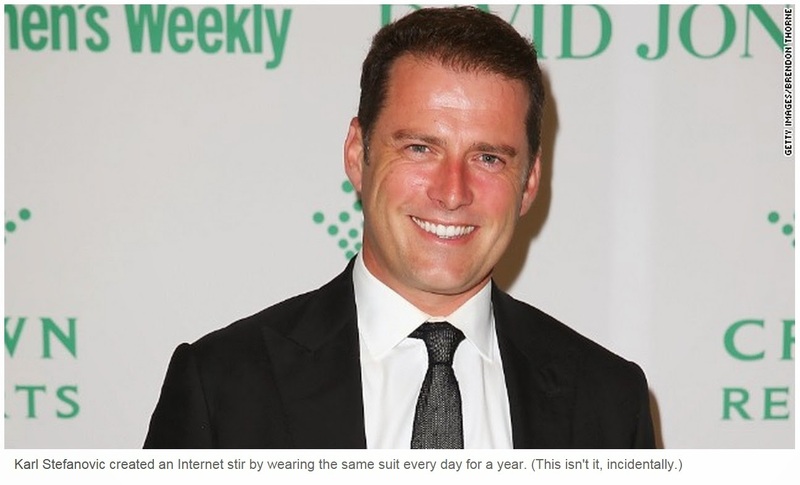 (CNN) -- Australian morning show anchor Karl Stefanovic wore the same suit every day for a year, minus a dry cleaning here and there. Nobody noticed. A double standard? Of course. Stefanovic was trying to make a point about sexism, he told Australia's Fairfax Media. "I'm judged on my interviews, my appalling sense of humor -- on how I do my job, basically. Whereas women are quite often judged on what they're wearing or how their hair is," he said. It's certainly nothing new. There are hundreds of "worst-dressed women" galleries after awards shows, but almost nobody publishes a "worst-dressed" gallery of actors; few keep track of Brad Pitt's hairstyles as assiduously as they do those of his former wife, Jennifer Aniston. And often, as Stefanovic pointed out on Monday's show, it's women criticizing other women. Indeed, there's a whole industry of gossip and fashion magazines targeted at women that exist to showcase women's clothing and "hot new looks," while in magazines aimed at men -- such as GQ and Esquire -- fashion and style are simply portions of a much larger scope of issues. It's "ridiculous," agrees New York-based style consultant Rachel Weingarten -- but nevertheless, she adds, there's something to be said for being noticed. "Is it deep down a good thing? Yes," she says. "From a business perspective, it's excellent that viewers feel connected enough or engaged enough that they can write to their local newscaster and say, 'Hey, you look kinda crummy today.' If you're being talked about, great. It means people care about your appearance." "I've noticed that with my (male) executive clients and CEOs, they're more interested in products for their face -- eye creams and whitening their teeth," she says. "So you may not notice it to the naked eye, but the bottom line is there's a lot below the surface we should look into." Besides, women have more options: a male broadcaster such as Stefanovic is pretty much locked into a suit and tie, while a woman can indulge in some variety (though TV image consultants may have something to say about that, as Wilkinson observed in a pointed speech). "It's not completely black and white," Weingarten adds. "It seems that way -- and it's unfair -- but there's a lot going on beneath the surface, too." Still, Stefanovic is glad he got the conversation going. On Monday's show, Wilkinson pointed out that his stunt even got attention in the Middle East. And now, at the urging of his colleagues, Stefanovic plans to change. "Only Lisa and (colleague Sylvia Jeffreys) know about the suit. They often remark that it's getting a bit stinky," he told Fairfax Media. "I'm hoping to get it into the dry cleaners at the end of the year."